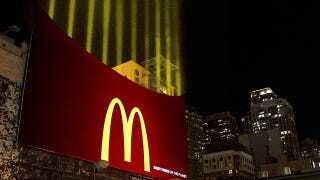 Instead of creating a healthier version for those hoping to indulge guilt-free, McDonald's' new billboard in downtown Chicago uses a set of focused spotlights to create what could be the world's most super-sized order of its famous french fries. The clever billboard was created by ad agency Leo Burnett for the restaurant chain's "Best Fries on the Planet" campaign. And on a clear night the yellow beams can be seen by hungry barhoppers and clubbers up to three miles away.